The real-time production line tracking tool and system is the primary need for digitizing shop floor production data. Avadhesh Tyagi, Director at Uditya Tech Private Limited shared about Uditya tech solution for live tracking of production lines data and system workflow. The software is a simple, very effective and proven system for “Live Tracking of Production Lines”. This system does not need RFID tag or Barcode tag or Touch button to track the production quantity from the end of the line. If you look at the garment production floor, there are several production lines and each stitching line consists of tailors who collectively stitch a garment. At the end of each production line, traditionally, factories check garment prior to sending to another department. How the Live Tracking System work? The workflow of the Uditya system is explained here. At the end stitching line, at the checking point, they put a device to count of the garments stitched, garments sent for mending/alteration and received back after mending/alteration. The device on checking table has three buttons: Green, Red and Blue. As soon as the checker receives a complete stitched garment he presses the green button which adds to the count of Actual. The checker checks the garment – If OK he puts it in the OK pcs – If Some Defect is found he presses the Red Button which adds to the count of “Reject” and sends it for mending/alteration. After the Garments are received back after “Mending/Alteration” he puts it in the OK pcs and presses the Blue button which adds to the count of “Rework”. Live data is sent to the WEB through WiFi router, updated in database in which Line No., SKU No. and Target will be entered against the device ID’s when the SKU is loaded on the line and displayed on Screens. The screen will display as below Dashboard. Total = Stitched – Rejected + Received after Alteration. The Green, Red, Blue, and Yellow areas on the screen will be updated live on all screens in front of the lines on the Production Floor. Hourly, cumulative production status, and performance/rejection % is displayed on TV Screens in front of each line. The live performance data encourages competition among tailors and line supervisor to outperform the other line. By using the live production data supervisor can control the line in a better way which I turn increases productivity. We have developed the required device on an Electronic PCB which is programmed to update the data on the WEB through WiFi. The software processes the data of each button received through the electronic device and displays it on an LCD screen on the production floor and on connected systems and mobiles. Software: Web Dashboard with Hourly Live Production Line Data, Line Wise and Style Wise Daily Production report – Summary and Detail and a Detailed Click Log with time. Hardware: WiFi enabled devices in High Quality Durable Box with 3 High Quality Click Switches mounted on PCB with Delay Timer and Smart Phone Power Connector, Programmed to update Dashboard on Web. This article is contributed by Avadhesh Tyagi, Director at Uditya Tech Private Limited. You can get in touch with him for more information about this software. 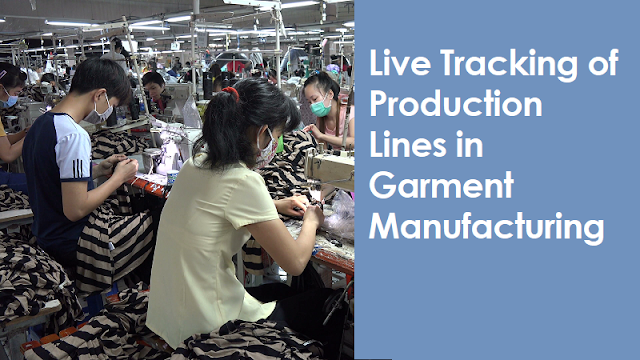 Application of live production line tracking systems. Workflow of real-time tracking system.